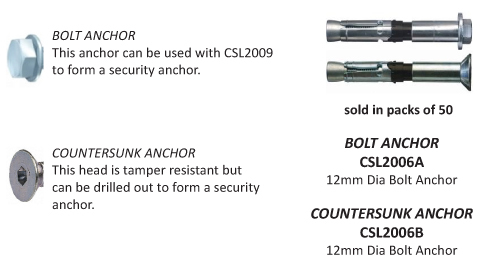 A heavy duty expansion bolt for securing heavy security products. Designed for high performance in static and dynamic load applications. For use in concrete, brick and solid blocks. Collapsible black plastic section prevents anchor turning in hole during setting and ensures reliable clamping of part fastened to overcome gaps. Available in Bolt or Countersunk in head.